My name is Anders and I'm the CEO of Brattoo Propaganda Software. I started my last letter by asking you for a favor. I asked for your ideas and feedback since that is what we base all our development on. Your needs. Tom was encouraged by this and said that he would prefer if Duplicate Annihilator would put the found duplicates in folders instead of marking them with the description field, so now we are implementing this feature as an option as well as some other features. Thank you Tom. So, please let us know what’s on your mind. We get a lot of questions about the Photos Library. For most of us it just works, and we never think about it, but there is so much to say that I think it is worth digging into. It can be very helpful from time to time to know about this. Apple Photos consist of two things; the application Photos and the Photos Library. The Photos library contains all the metadata, all albums, some databases and your photos files (mostly). You can have one or many libraries but only one of those can be the System Photo Library, more about this later. The Photos application is located in your Applications folder and the Photos Library is by default located in your Pictures folder which is located in your Home folder. 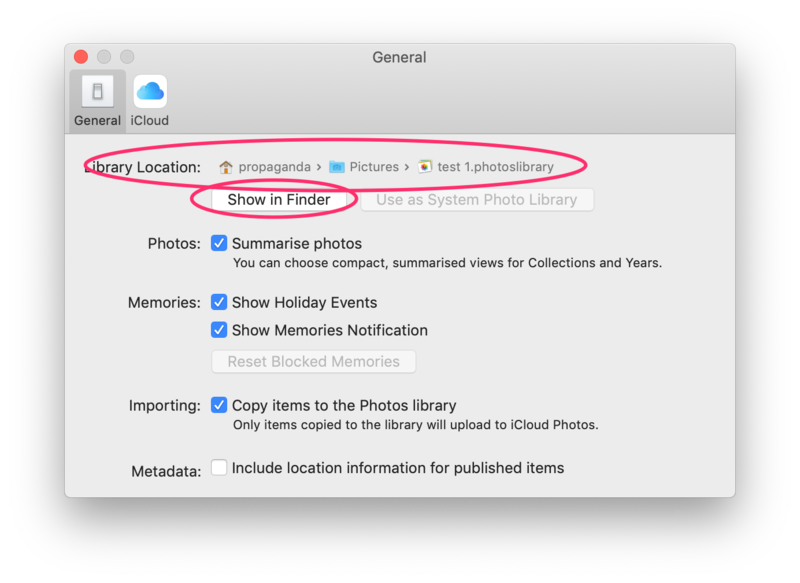 If you want to find the exact location of your Photos Library then you can find the path to it in “Photos preferences” where you also find a “Show in Finder” button. The “Show in Finder” button will open up a Finder window where your Photos Library is located. The Photos Library can be moved to an external hard drive if you run out of space on your Internal hard drive. Apple used to recommend not to store the Photos Library on the same disk as where you keep your Time Machine backup but that has been fixed, at least since Photos 4.0 and macOS 10.14 Mojave. Multiple libraries? Yes, you can have multiple libraries for many reasons, and if you use multiple libraries we would love to hear from you as to why you do. To create a new library or select which library you want to open simply hold down the option key while you start Photos. A dialog box will appear where you can choose any of the albums that Photos already knows about, select another library that Photos is not yet aware of, or create new one. One of your Photos Libraries is the System Photo Library. The photos in the System Photo Library are also available in other parts of macOS like the image browser in the Finder. The System Photo Library is also the only library that can be synced with iCloud. 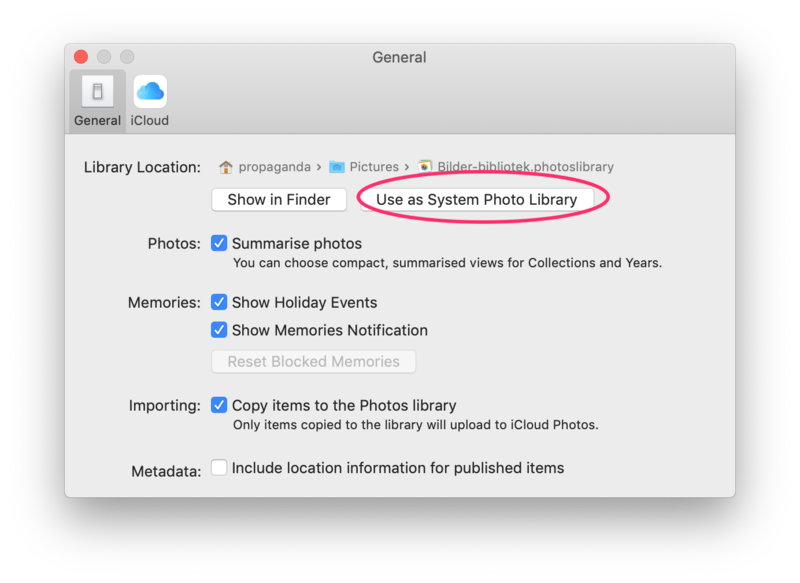 You can change which Photos Library that should be the System Photo Library by opening the Photos Library that you want as the System Photo Library, then clicking on the “Use as System Photo Library” in the Photos preferences. What about iCloud then, what if I have synced my System Photo Library to iCloud and then suddenly change my System Photo Library to a new one and activate iCloud for that library, what will happen? Well, your new System Photo Library, with enabled iCloud, will merge itself with all photos that you have stored in iCloud. I will dig deeper into iCloud and Photos in another newsletter. In the Photos preferences you’ll find a checkbox named “Copy items to the Photos Library”. If this checkbox is checked then all photos that you import to Photos will be copied and stored in the Photos Library as an image file. If it is unchecked it will not be copied to the Photos Library but the Photos Library database will be updated so that you can watch and use the image from within Photos. Photos that are not stored in the Photos Library are called referenced photos. So what should you choose? If you want to manage the storage of your photos by yourself, select a folder structure that you prefer, then you can choose to use referenced photos. There are some drawbacks though. If you delete a referenced photo from Photos it will not be deleted from the disk. Only the representation in the Photos Library database will be deleted. Also, referenced photos will not be synced to iCloud if you use an iCloud enabled Photos Library. So what do I recommend? I recommend that you have this checkbox checked so that you can fully utilize the Apple Photos features. If you use referenced photos I would love to hear from you, and know why you have chosen to do so. Things can go wrong and break and when that happens you want to be able to repair it. The same goes for the Photos Library. A damaged Photos Library can result in many different things like odd behavior, missing or damaged metadata or that Photos can’t open the library. To fix this simply hold down the option and command keys while you start Photos and a repair will start. In rare cases Photos might have forgotten about where your Photos Library is located and therefore the repair won’t start. 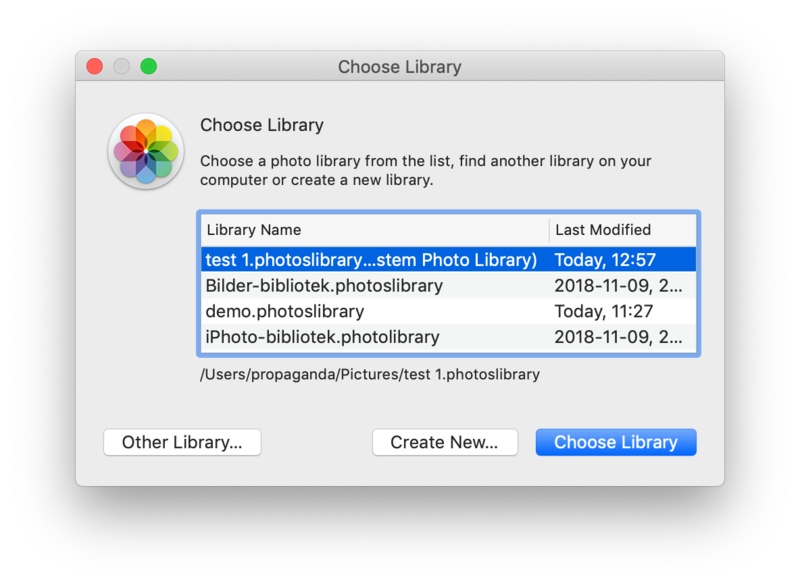 In this case start Photos while holding down the option key, choose your library and then hold down the option and command keys when choosing the library. Another way to do it is to double click on the Photos Library in the Finder which will trigger Photos to open that Library.